New Kia Sedona may not reach UK | What Car? 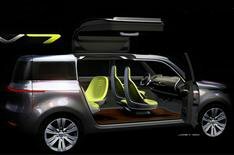 Kia is to unveil a large MPV concept car at the Detroit motor show, which could turn into a replacement for the Sedona. However, the KV7 concept is understood to have been ruled out for Europe because Kia believes the market for full-size MPVs is shrinking. Sources say the new five- and seven-seater Carens MPV due in 2012 will be more flexible and do a better job of filling the hole left by the Sedona in European markets.